You are currently browsing the tag archive for the ‘Marrickville Independents’ tag. Tuesday’s Council meeting was perhaps one of the most important meetings of the year as the Asset Management Strategy Policy was on the agenda. This report was recommending to increase rates, always a hot issue when it hits the public purse. 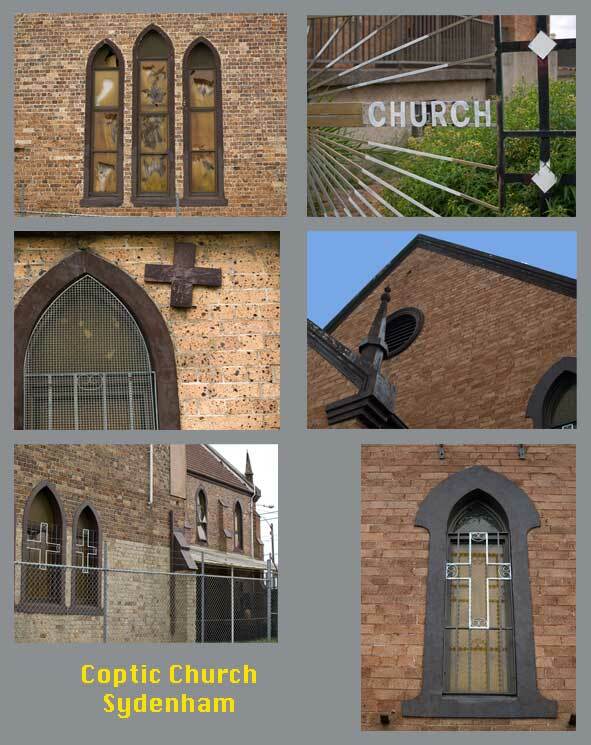 Money was central to most of the issues on the agenda from a donation to Haiti, whether to spend money on Addison Road or on Marrickville Railway Station, to giving the Greek Orthodox Church in Marrickville financial assistance of $5,000 to quieten down their new digital bells & to the Asset Management Strategy Policy prepared by Council staff. There may have been more, but we did not stay until the end. Many residents are aware that Marrickville Council doesn’t have the money to fix things as most requests from the community take a long while before they reach the top of the list of the actions council is taking. Staff & councillors have openly said to me on a number of occasions that Council just doesn’t have the money to do certain projects. For me, it was obvious when reading through last week’s Tree Management Issues Paper that Parks & Gardens have been functioning under-resourced & under-financed for many years. After what I heard discussed last night, I would not be surprised if many departments in Council are experiencing the same restrictions. 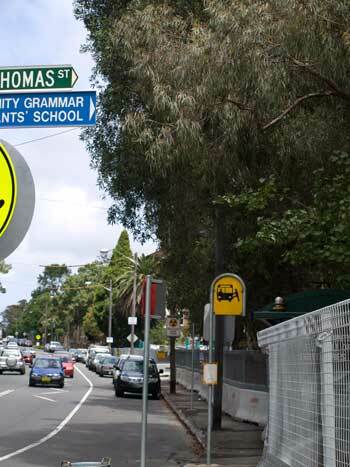 Put simply, Marrickville Council finances are in trouble. Council’s financial unsustainability was not going to improve unless they improved their financial position significantly with one option being to increase rates. Marrickville Council does not have enough money to repair its assets or maintain its infrastructure. A recent & public example is the old & beautiful Coptic Church in Sydenham Green, which featured in Council in 2009 & again last week. The Asset Management Strategy Policy was recommending that the councillors decide whether or not to apply to the minister for a rates increase (special levy). The debate between councillors covered the history of some projects & of previous applications for rates increases, how much public works actually cost (eg $350,000 for paving in Dulwich Hill shopping strip, $15,000 for a speed hump, $35,000 for a round-about) & about the financial burden of servicing 1 billion dollars worth of infrastructure before you even build anything new. Despite the importance of the issue & the strong views held by councillors, the meeting was polite. There was negligible need for the chair to intervene. The flow of the discussion allowed the councillors to ask many questions to the staff & I was impressed by the extensive & considered strategic advice they offered. They explained how these processes work, what is the financial situation of council, what could be done with any additional funds in the kitty & what might be done if council did not apply for the special levy. Councillors expressed concern about the financial status of council. As expected, there was divergent opinion as to the best way to manage this situation. I am deliberately lumping comments & strategies together to keep this brief. Apologies for any mistakes. The Greens expressed concern that Council was in dire financial straits & if left until next year, the situation would only worsen reminding that this issue has been deferred for many years. They believed if the community was asked whether they would pay about $1.60 per week per household or 96 cents per week for lower income households for better roads, better footpaths & better infrastructure, the majority of rate-payers would say yes. They were also worried about Council’s ability to pay staff & ability to maintain the substantial assets we have. They wanted the money raised to be used for priority infrastructure renewal works. They also reminded everyone that it has been 5 years since the last rate increase. They also argued that if left until next year, councillors will be afraid to pass a rate increase because of fearing community backlash with the upcoming election. The remaining councillors wanted to defer the decision for another year saying that while they were concerned about Council’s financial situation, they wanted to know whether there were other cost saving measures & revenue accruing avenues that could be explored before going the route of raising rates. Some suggestions were closing some of the libraries, advertising on billboards facing the airport road at Tempe, life-cycle planning, community consultation with residents, continuing to educate council staff on safe work practices to reduce worker’s compensation payouts, looking at verge mowing & paid parking, increasing fees to use sports ovals & child-care facilities, getting rid of unnecessary programs & operations & selling off the Marrickville Hospital site (council has not made a decision about its future for some while). The vote by Councillors Iskandar, O’Sullivan, Wright, Thanos, Hanna, Macri was to defer for 12 months. SoT concentrates on trying to save, preserve & protect healthy trees in public spaces, yet sometimes the loss of trees on private property deserves mention. 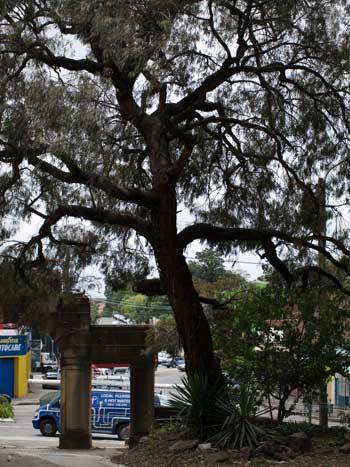 Generally most residents of Marrickville LGA are unaware of the loss of the older, perhaps historic trees unless they are directly affected or when they recognise that ‘something’ in a particular area has changed. The presence of trees is something we take for granted & it is often only if they all go & the landscape is radically changed that we recognise their loss. I have decided to document the loss of our big older trees or when a mass of trees are removed regardless of whether they were situated on private property or not. This post informs of a recent loss & one that is about to occur. 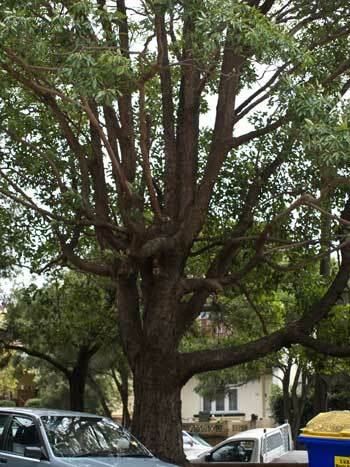 In September 09, 2 heritage listed 77 year old Fig trees, 1 other Fig tree, which were alive & growing in 1943, 1 mature Plane tree & 2 mature Eucalypts were chopped down in Ferncourt Primary School Marrickville South to make way for the building of a school hall as part of the Federal Government’s stimulus program. The loss of these trees caused much grief to those in the community who know about it. The community tried to find solutions that would enable all the trees to be retained, but their efforts were unsuccessful. You can read about these trees & see photos at the following –http://ecopond.blogspot.com/2009/09/trees.html Thanks to Voren a local resident who sent me the link to her blog. Last Tuesday 2nd February 2010 the Labor & Independent councillors voted to approve a DA for the St Vincent’s de Paul State Office 2C West Street Lewisham. Many of you will know it as the old Lewisham Hospital site. It is situated across the road from Petersham Park with its lovely oval, numerous old, very special trees & the Fanny Durak Pool. The DA was seeking to demolish an existing brick & stone fence, remove 32 31 mature trees & construct a new fence, driveway & landscaping. The trees that are to be removed give the feeling of a tree-lined avenue as they match those on the opposite side of the road in size & were probably planted at around the same time so their loss is going to have major visual impact. 3 Palms will be relocated. the existing fence does not provide sufficient security for residents of an aged-care facility & a woman’s refuge on site. the fence is also suffering structural problems due to the height of the soil inside the property & the presence of mature trees, both of which have caused the brickwork to move & lean outward in some parts. While I agree with both points, after going to the site & having a look, I believe that the removal of the trees is unnecessary unless the aim is to get a more modern, streamlined effect to match the new shiny glass black building. The fence is bowing outwards. The ground is built up on the inside of the fence. This looks to be deliberate & would have been in place for many decades. I wonder why they just cannot remove the old brick fence, built a new, higher one to improve the security & replace any soil dislodged during construction of the new fence. If they do this, they will be able to retain most if not all of the trees. St Vincent’s de Paul intends to replace the 32 trees with a mix of lawn, low scale planting, screen planting & Crepe Myrtle, Tuckeroo & Summer Red Gums. I think they want to do this to modernise the place & perhaps allow more onsite parking. The trees to be removed are decades old. I would guess around 80 years. 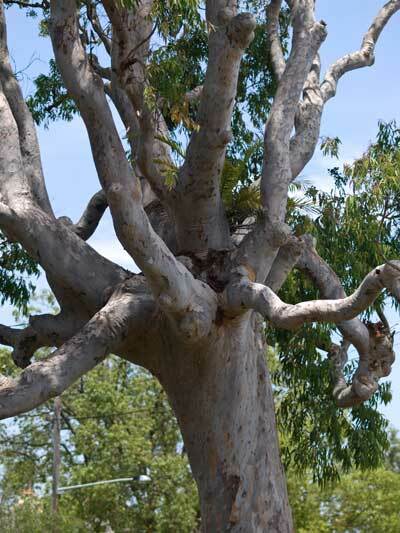 Most have massive trunks (2-3 metres) & as such are significant sequesters of CO2. The front of the Lewisham complex looks a mess at the moment because there is building work happening & the front & side of the property has a cement barrier erected to prevent pedestrians being flattened by any part of the fence if it decides to collapse. However, when you enter the property, the noise immediately abates because the trees block a lot of the traffic noise. It is cool, visually pretty & smells nice. It is a relaxing place despite the construction work. complex is dotted with enormous Eucalypts & other trees, all of them mature. 3 Kookaburras live in the trees which are to be chopped down. residence in Petersham Park because animals are territorial & other animals probably won’t allow them to move in even if the conditions are right. 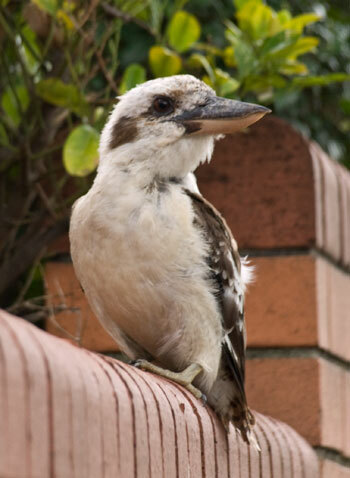 The St Vincent’s de Paul complex is a green oasis that provides significant habitat for wildlife one block from the heavily trafficked Parramatta Road & about 6 kms from Sydney CBD. It’s not that I think everything should stay the same & there should be no progress, but sometimes progress can ruin something very special. I’ll start this post with a clarification concerning the last post Cambridge Street tree axed today. I realised over breakfast this morning that I had generalised when I said, “Once again, regarding the Cambridge Street tree, the Greens voted to keep the tree. Once again, the vote to remove the tree comes from the other counselors.” In fact, with regards to the Cambridge Street tree, Independent Councillor Morris Hanna did not vote, as he was not in attendance at that particular meeting. My apologies to Councillor Hanna. I have decided to do another post on tree news from around the world. I am assuming you will find it as interesting as I do & it gives us comparisons in which to measure our own Marrickville Council in regards to trees. I received interest from the UK regarding the last post, where I mentioned that some Australian municipal councils erect billboards in place of trees that have been deliberately vandalised to get better access to a scenic view. Perhaps UK councils are considering using billboards to act as a deterrent to the recent rampant vandalism of trees in their country. Caitlin from Save Our Figs in Newcastle found the following for me which, though old news, made me roar with laughter. In 1998 Port Stephens Council on the mid-north coast of NSW placed 2 shipping containers on top of each other on a cliff in place of 20 trees that were illegally cut down to gain access to better views of picturesque Boat Harbour. Post Stephens Council also planted saplings to replace the trees & intended to keep the shipping containers in place for 3 years until the saplings reached a decent size. Unsurprisingly, the locals were not amused. In Seattle USA, a dozen 50 year old Fir trees both on private & public land were chopped down in the middle of the night to make way for better views. Seattle doesn’t require a permit to chop down trees on private land unless on slopes or along the shore. It calls itself the Emerald City, yet Seattle’s percentage of tree canopy has dropped from 40% in 1972 to 18% currently. Seattle is trying to regreen the city to the first target of 30% cover. In 1999 the budget for Parks & Recreation was US$250,000. In 2010 it is US750,000 rising to US$1.2 million in 2011. This is serious tree planting money & I would be interested to learn of Marrickville Council’s budget for tree planting. Perhaps it would be fairer to compare the budget for City of Sydney Council instead. The same article reminds readers of when a senior Seattle Judge was fined US$500,000 after he was found guilty of illegally chopping down 120 trees in a public park below his house. The trees obscured his view of Lake Washington. Can you imagine chopping down 120 trees in the middle of the night? He must have been strong & fit as none of the men I know would be up to this job. No words of his position as a Senior Judge & bastion of society. Tree news is a fairly recent phenomenon. It used to be that only the most profound or shocking tree news was reported, but in recent months a great deal of tree related news is being written in the papers & on the internet. This post is again too long so I will post the second part of recent news soon. 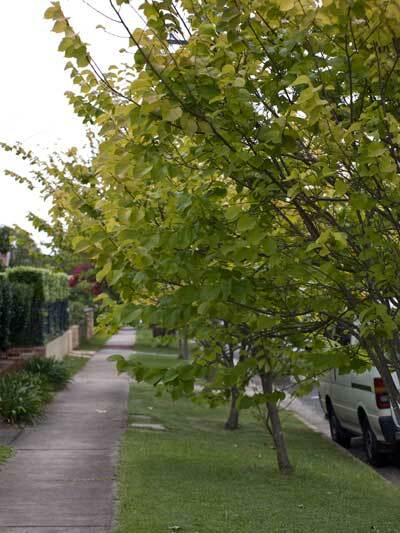 Councillor Cathy Peters of the Marrickville Greens put a motion before Council last night in an attempt to delay the removal of the magnificent Lemon Scented Gum street tree in Cambridge Street Stanmore until all other avenues that could save it were explored. A resident of Cambridge Street and I spoke for saving the tree. The residents who wanted it removed also addressed council. The Greens voted for the motion & Labor & the Independents Cls Marci & Thanos voted against the motion. Therefore, the motion to save this tree failed. The tree will be chopped down shortly. I personally think it will be a huge loss to the residents of Cambridge Street & in terms of climate change, the whole community. By my calculations, this single tree with a trunk circumference of 2.5 meters sequesters 388.2 kg of CO2 per year. To my mind, this alone makes the tree exceptionally valuable. The tree itself is also very beautiful & cascades over Cambridge Street cooling & making the air smell sweet. I could go on about this tree’s benefits, but sadly it is to be lost. A new ‘more suitable’ tree will be planted in its place. Cambridge Street will not be the same again, a lesson in impermanence. You may come across a Marrickville Greens flyer advertising a public meeting about the proposed DA for the Marrickville RSL site. I have posted a couple of times about this development application because it is the first of many such high-rise buildings which will change Marrickville as we know it forever & not for the better in my opinion. 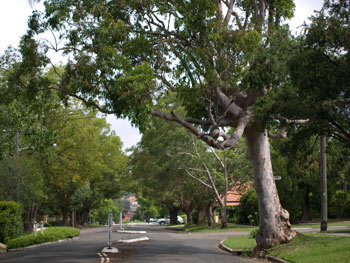 Many residents are very upset & angry with the RSL site DA & Marrickville Council’s Draft Local Environment Plan (LEP). I am not unhappy about the return of the RSL. I never went to the old one, but many of my elderly neighbours went on a daily basis. It gave them an affordable hot meal & some social activity, which benefited them on a number of levels. The problem with this particular development is that at 9 storeys it is too high, almost double the height of the latest developments on Marrickville Road. It will include 128 units. One could realistically would anticipate at least 2 people would live in each unit. This is a lot of people on such a small piece of land housed less than council’s own restriction of 30 metres from a railway line. There will be 398 parking spaces & a supermarket twice the size of Woolworths. The supermarket will be open from 7am – midnight Monday to Thursday & 7am -1am on Saturday through to Sunday morning & from 8am – 11.30pm on Sundays. This supermarket will be open more hours than closed. 5 loading docks will operate from 6am – 10pm Monday to Saturday & 7am – 9pm on Sundays. There will be phenomenal traffic to the supermarket, the residential units & the RSL Club. The developer anticipates 590 vehicles an hour. Illawarra Road & surrounds is barely coping with traffic during peak hours now. Blind Freddy can see that large amounts of traffic will spill into surrounding streets resulting in more noise & pollution. I know this to be true, as traffic in my street has tripled since we moved here. 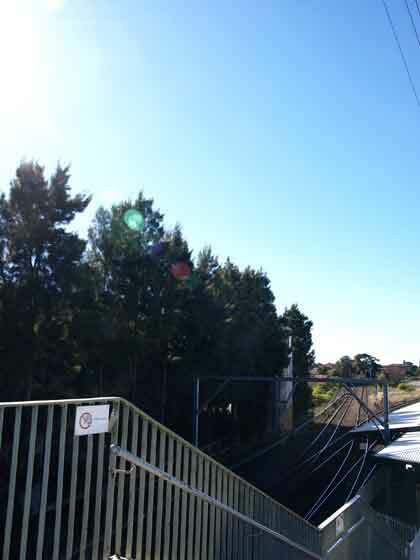 Marrickville already suffers from noise from planes, trains & automobiles. When will Council & the State Labor Government think we have reached our limit? 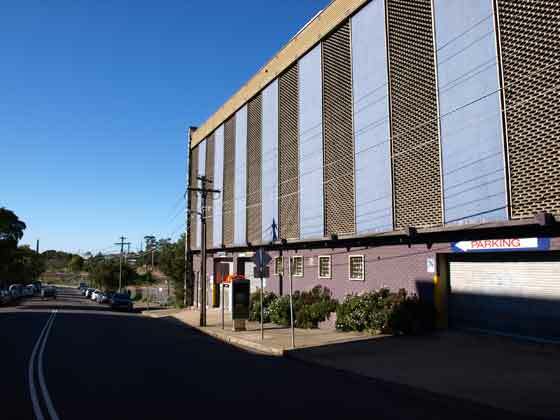 The Draft LEP passed by Marrickville Council last month agreed to high-rise development (7-9 storeys) along Marrickville Road in the Dulwich Hill & Marrickville shopping areas & along Illawarra Road from Marrickville Road to Warren Road. Most of the block between Illawarra & Petersham Road will also be similar high-rise development. Many shop owners attended the council meeting that passed the draft LEP & they definitely approved of this plan if the amount of clapping at cheering was an indication. Apparently 38 shops along the Marrickville strip are currently empty. I suppose they think with 4150 new residents, business will improve. I would guess that business would be good for the supermarket at the RSL site, but unlikely elsewhere. Smaller grocery stores will be competing with 2 big supermarkets & I am not including Banana Joes. Development has to happen because Sydney is growing at a phenomenal pace & not everyone wants to live in the newer outer suburbs, nor should they have to. The Labor & Independent councillors repeatedly stated during last month’s meeting that they preferred high-rise in the town centre rather than building residential units in our suburban streets. So do I, but such comments might be interpreted as threatening the residents & manipulating the issue: Shut up or multi-storey units will go up in your quiet street. I can’t see any green space or trees in the RSL site plans. With a development of this size it is imperative that open green space is available for the residents & their children. 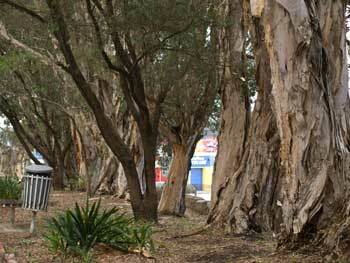 The closest park is at the bottom of Byrne Street & it is small & lacking in facilities. The DA intends to remove the pedestrian crossing to this park for greater access for their trucks. The Marrickville Greens will be holding a Public Meeting on – Wednesday 23rd September 09 @ 7pm @ Herb Greedy Hall –79 Petersham Road, Marrickville. Regardless of your political preferences, please attend this meeting & hear what the issues are in more detail. Attendance will send a message to Labor & the Independents that the residents are prepared to take a stand on this, not just sitting back while their community is ruined. PS The lights were back on again in Mackey Park when we went for a walk a couple of nights ago. Thanks to whoever is responsible. The meeting was filled with excitement from both the gallery & some of the councillors. It started with each councillor having to declare pecuniary interest & listing the properties held by themselves or their families in the area. This was very interesting & perhaps explained the excitement. Then an 1880’s heritage building & Art Deco units were voted to be demolished. A few weeks ago the Beynon & Hayward building on Livingstone Road Petersham was agreed to be demolished for a car park. I’ll leave this for Marrickville Heritage Society to comment on, suffice to say heritage does not count for much with all but the Greens. So the situation is the NSW State Labor Government intends for Marrickville council to add an extra 4000 dwellings in Marrickville by 2031. First up is the old RSL site, which I posted on last month. 7 storeys with 2 storeys designated for retail – one space at 600 sq mts, perfect for a supermarket. Traffic along Renwick Street going up to Woolworths was counted a couple of years ago at around 575 a day. The developer’s plans expect 590 cars per hour. This is a mammoth volume. Even if this means peak hour only, the traffic spill off on our streets is going to be horrendous. This is a tree site, so I have said enough. The September 10th edition of the Inner West Courier isn’t available on the net yet, but if you go to http://digitaledition-innercity.innerwestcourier.com.au/ you can view it when it is posted. Note also the front page reporting that Planning Minister Kristina Keneally has backed down after community pressure over development at White Bay. People power can be effective. The recent opposition to the loss of the Figs has proven this. Please contact Mayor Iskandar & tell him you don’t want 7 storey or above development in Marrickville. siskandar@marrickville.nsw.gov.au 9558 7777 or 0408 210 618 If we sit back & do nothing, it will happen. Mayor Iskandar says these changes will affect us for the next 25 years, more like forever I say. I have just finished setting up a new page – Media. Saving Our Trees received wonderful coverage from The Valley Times & the Inner West Courier over the course of the Mackey Figs campaign. They can be viewed online by going to the Media page on this site & clicking on the links. While I was doing this, I went through the Marrickville Greens web-page http://marrickvillegreens.wordpress.com/ & saw 7 articles which supported the work of Saving Our Trees. I would like to thank Marrickville Greens for their incredible support toward Saving Our Trees (SOT) since its inception in mid June 09. 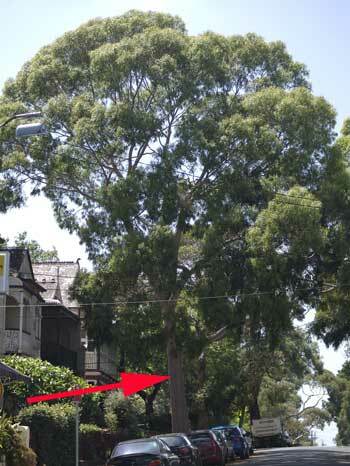 They supported saving the Eucalypt tree outside 11 Union Street Dulwich Hill & the 2 Figs in Mackey Park. I would also like to say that SOT is deliberately non-partisan because I did not want to be dismissed by some doubters as ‘another Greens party activity.’ I wanted SOT to be a another voice for trees in Marrickville LGA & those people in our community who agreed with the aims of SOT regardless of their political preference. That Marrickville Greens have publicly supported the 2 campaigns of SOT was not something previously negotiated. This makes their support very special to me as it is real & confirms that I am on the right path with what I am doing. 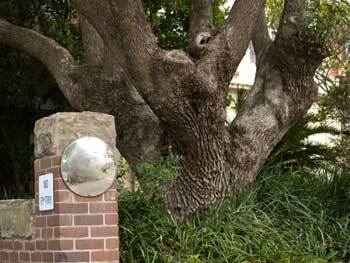 I invited all Marrickville councilors to the Saving the Mackey Park Fig Trees Party. I genuinely wanted those councilors who voted to remove the trees to attend, believing that experiencing what it was like to stand under the mammoth canopy of these Figs would be a vastly different experience than seeing them from the road. I hoped this experience would make them change their minds regarding their decision to remove them. That Labor has reversed their decision to remove the Figs because of community opposition has made me & many others in this community very happy. I just hope the 2 Figs are saved when the final decision is made, I think sometime this month. The Mayor did not sound determined in his speech at the park that afternoon, though Councilor O’Sullivan did. I am disappointed not to hear from Independent Councilors Macri & Thanos about the trees. They did not make even a courtesy response to the invitation to attend the party. In my opinion, there are other issues that are still unresolved with the proposed upgrade of Mackey Park. 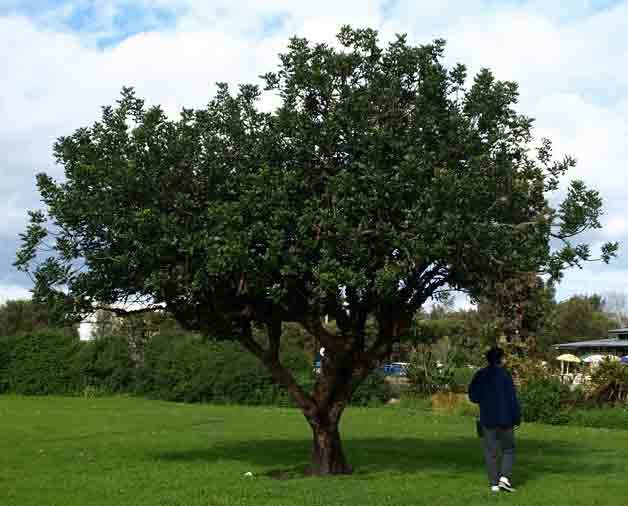 4 healthy Carob trees are to be removed: 1 for the cricket oval & 3 to make way for a circuit path. These trees were probably planted when the park was made. They are old, about 6 metres tall & still provide Carob for at least one local family who have been collecting from these trees each year for the past 45 years. This family are grieving the loss of these trees. Councilor O’Sullivan told me Council will plant other trees in their place. She did name them, but I have forgotten what they are. I don’t really care about what trees will replace these Carobs. I care that 3 healthy trees are being cut down for a path that no one wants. I think to lose them is completely unnecessary. A path can go anywhere. Then there is the issue of the current central path through Mackey Park, the lights along this path & the exit opposite Tempe Railway Station. The latest plan is to have the circuit path branch into 2 paths: one towards the river & one towards the Marrickville side of Richardsons Crescent. Why when both are dangerous & substandard options? I think people will ignore these new paths & continue to walk across the centre of the park, even if they have to walk on the grass to do this. I also think people will cut an opening through the fence opposite Tempe Railway. We still have time to tell our councilors that we want to save the 4 Carob trees & to discuss the path, lights & exit. The councilors of South Ward, which looks over Mackey Park, are Peter Olive (Greens), Mary O’Sullivan (Labor) & Morris Hanna (Independent). I encourage you to send them an e-mail or give them a call before we lose these things.